IELTS stands for International English Language Testing System, is designed to assess the English language proficiency of non-native English speakers who need to study in Europe, America, Australia, or Work where English is the language of communication. The IELTS test was introduced in the year 1989 and the IELTS test is available in two formats; Academic Module and General Training Module. >> Which is best for IELTS, British Council or IDP? Academic Module is suitable for the students seeking entry to a university or institution of higher education offering degree and diploma courses. General Training Module is appropriate for those who are going to English-speaking countries to complete work experience or seeking entry to a secondary school or to vocational training courses. 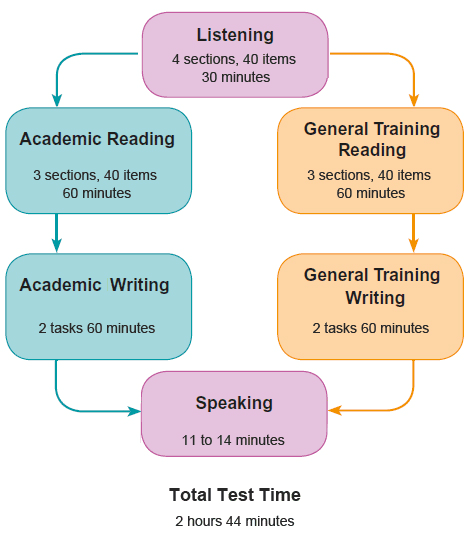 The IELTS speaking test may even take place a day or two later at some centres. IELTS Listening Test lasts for about 40 minutes (including the 10 minutes transfer time). 10 minutes for transferring the answers to an answer sheet. It consists of four sections, with ten questions in each section played on cassette tape, in order of increasing difficulty. Each section might be a dialogue or a monologue. The test is played once only, and the questions for each section must be answered while listening, although time is given for students to check their answers. IELTS Speaking Test consists of a one-to-one interview with a specially trained examiner. The interview is recorded and has three separate parts: An introduction and interview, an individual long turn where the candidate speaks for one or two minutes on a particular topic, and a two-way discussion thematically linked to the individual long turn. This interview will last for approximately 11-14 minutes. There is no minimum score required to pass IELTS. IELTS score is evaluated on a scale from 0 to 9 points. Most top universities require 6.0-7.0 overall IELTS score for admission. >> How To Get Band 7+ Score in IELTS Exam?